Monopoly: Halo Collector's Edition is a Halo-themed adaptation of the famous Monopoly board game, released in 2015. 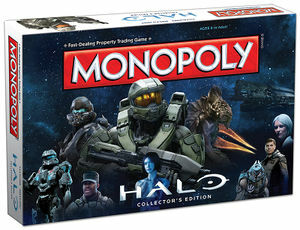 “ Join Master Chief on a campaign to gain control of critical locations and legendary assets from the Halo® Universe in the special collector's edition of Halo MONOPOLY. Use your wits to take command of Arcadia, the Covenant capital of High Charity, or even Earth itself.